Are you surprised? It's not a Christmas Card! In truth, I have been making loads of cards, however, I can't show them yet because they have been made for birthdays that have not yet happened..So, for now, this is one I can share. This is, if you haven't guessed, Blue Fern Paper. The Heartland Collection. Locally you can find these papers at Ever After in the Paradise Scrapbook Boutique booth. You just might find this card there too. I'm always asked where did the inspiration come from? Actually, lots of places. 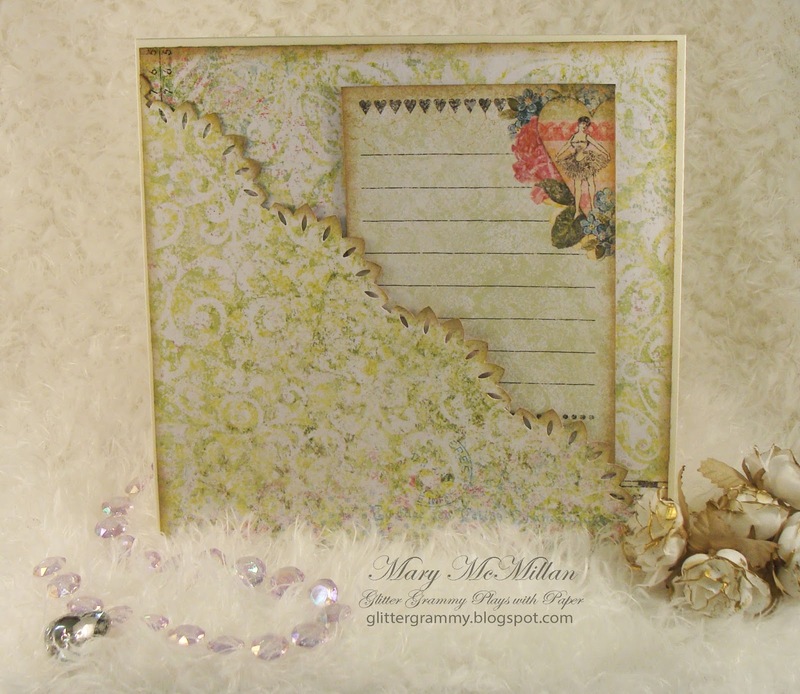 I follow other paper crafters blogs, I follow through Pinterest and most often, I am inspired by those around me. I am also inspired by parts of a piece of decorative card stock. For this card I was inspired by a portion of the card stock. The two lovers. 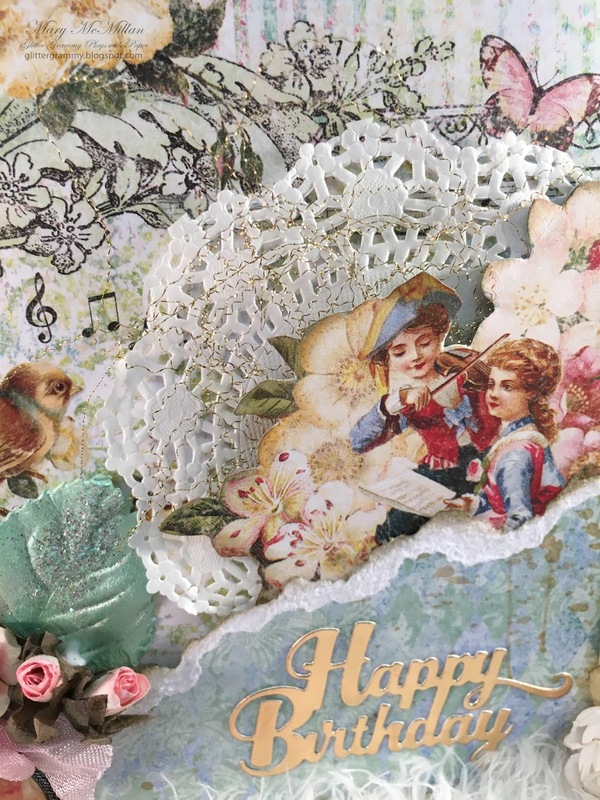 I fussy cut around them and started pulling embellishments that I thought would look pretty with them. I decided to make a square card 6x6. 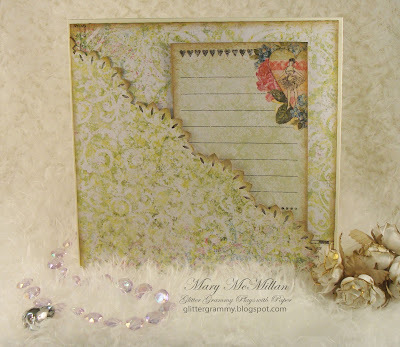 One of the papers in the Heartland collection was the perfect background. Next came the torn piece that allowed the graphic a place to sit, but I needed something to separate the graphic from the background....doilies are perfect to add separation. Next I gathered flowers to make a bouquet. I added seam binding that I'd sprayed with water to get a crinkled effect. I needed a sentiment, and I chose Just Rite Happy Birthday and cut it from gold paper. When I began assembling, I thought the card looked too flat and needed something more. I added the leaves behind the bouquet. Nice but something more needed to be added. Can you see the gold bits in front of the doily? I'm not sure what it is called. I bought it to add glitz to my tiny Christmas tree. I think it's perfect for this card. If you want to know more about it, Kim at Ever After could put you in contact with the vendor selling the product. It doesn't look like this when you purchase it, it looks like a cord, but when you stretch it, this is what you get. I like it! 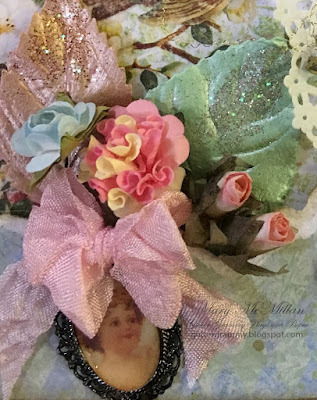 I still wanted to add something vintage to this card, so I created the cameo and placed it below the ribbon. The frame of the cameo is from Epiphany Crafts and it started it's life silver in color. I didn't want silver with the gold, so I colored it using Spectrum Noir alcohol ink pens. The graphic was cut from one of the pieces of Blue Fern card stock. The photo isn't the best, but I think you get the idea. I used parts of the same card stock. I like giving my sentiments a place to sit. These little envelopes are a great place to put gift cards. 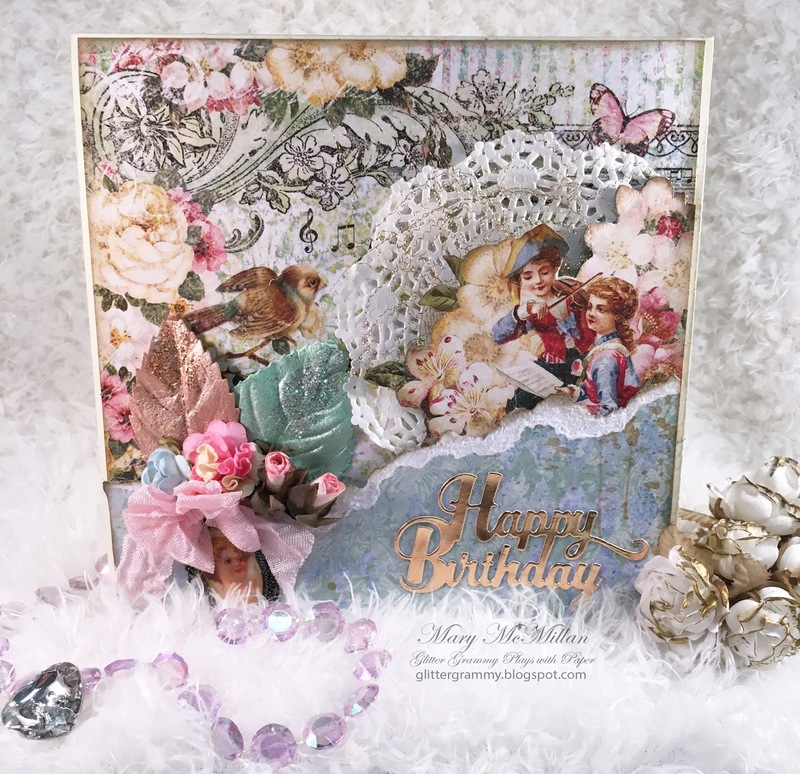 Most all supplies for this card were purchased at Paradise Scrapbook Boutique. I hope you enjoyed reading about my little creation. I love reading other blogs about how something was created. I'm off......I'm sending you wishes for a most happy day. I hope you find time to sneak away to create. So gorgeous! You outdid yourself this time!